What type of grease is used in a SlewPro bearing? Shell EP2 Lithium grease. Other brands and types are available upon request. I have a bearing from another manufacturer. Can I get an equivalent SlewPro bearing? Yes. We can cross all manufacturers’ bearings. I have a swing bearing on an excavator. Can you supply a replacement? We have a growing list of replacement bearings for major brands. The OEM protects this data so unless we have already converted your model we will need a drawing in order to cross. We can reverse engineer any bearing but it would have to be disassembled from the equipment and shipped to us. I have a new application and do not know what bearing will work. Can you help? SlewPro’s team of application engineers can work with you every step of the way in properly sizing the best bearing suited to your application. I cannot find a “standard” bearing that will work for my application. Will it take longer to produce a special? All SlewPro bearings are made to order. There is no such thing as a special. Our average lead time for any bearing is 10-12 weeks. We will always spec the exact bearing for your application. We are an OEM and can forecast our production requirements. Will SlewPro stock? We regularly work with OEM’s under blanket purchase orders with scheduled releases. Let SlewPro help you manage your inventory so that you get your bearings on time every time. My application is for a bearing with external gear teeth. 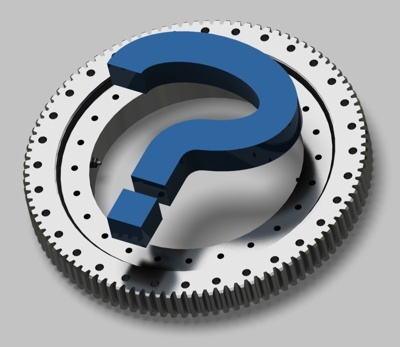 Do you offer matching pinions? Yes. We manufacture all type and sizes of pinions. Like our bearing there is no such thing as a special. Just tell us what you need and we can supply it. I am an engineer working on a new application. Do you offer drawings? Yes. All bearings listed on our web site have downloadable links. These are 3D models, DWG files and PDF files. If your bearing is not listed simply ask and we will be happy to provide this information to you. We are engineers and know how much it means to not have to redraw a bearing out of a catalog. Do SlewPro bearings come with a warranty? Yes. A one year warranty is offered on all SlewPro brand items. Increased warranties are available upon request and may require an additional cost. The full description is available here. I am not going to use all of my bearings at once. Will they rust if I put them in inventory? No. All SlewPro bearings have a protective oil film on them with a kraft paper overwrap and then a plastic overwrap to lock out moisture. I need to know which teeth are the high point of my bearing so that I can set up my backlash. Is this addressed? Yes. All geared bearings have three teeth painted to identify the high side of the bearing. I need my bearing in less than 12 weeks. Does SlewPro offer expediting? Yes. By utilizing air freight we can have any bearing here in 6-8 Weeks. There is an additional cost for this service.